Home Fashion Do you Dare to Try Sheer Blouses with Silk Sarees? 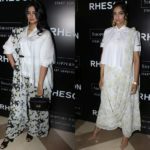 Sheer blouses are right now in the fame hall of Indian fashion. It is one of the most sought-after blouse model for this season. However, having said so, can you pull off sheer blouse with a silk saree? These trendy blouses go way beyond well with a designer or party wear sarees. Yet, pairing them with silk might daunt even those who get so experimental with sarees. That’s why when we looked at Karishma Kapoor sporting a black and green Raw mango saree with a white sheer blouse, we want to share how she made this style work in favour of her. On the surface, it is still a tricky blouse to carry off with a silk. Seems like, Karishma balanced it out by opting for a sleek saree instead of heavy one. Thus, the blouse looks so blended with the saree and giving a stylish appeal here. Also, she is wise enough to not overload this saree look with jewelleries and other intrusive makeup. All she did was to go for a sling bag and a simple makeup to round off her look. We actually love how Karishma made this blouse and saree look together well. Do you dare to wear sheer blouse like this with traditional sarees? Comment and let us know. 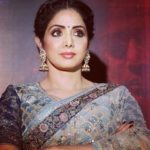 The Saree Hack You Should Learn from Sridevi! Highly Stylish (Also Affordable) Palazzo Sarees On Your Way! This Net Saree Look Of Sridevi is Totally Adorable! 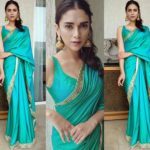 Sometimes Your Silk Saree Needs Just a Simple Blouse – Here is Why! Next articleSarees and Sunglasses – Unbeatable Duo!